Market Prediction. Are Dow-Jones average movements predictable? Financial news often attempt prediction of major index movements in terms of 'bad', 'gloomy' or 'rally' days for the markets based on the observed opening values. Here we would like to answer the question whether such a prediction is possible. 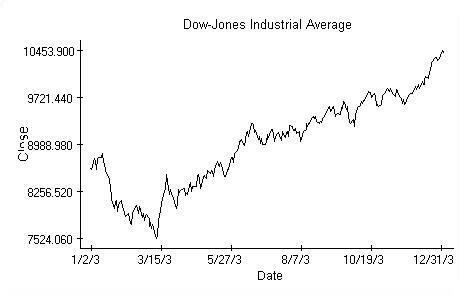 To find the answer we study the Dow Jones industrial average values from 2003. The data show that a prediction is feasible, though the opening data are not enough. Historical data going at least three days back are necessary for a reasonable forecast. where o[n] is the index value on New York market opening. The return values rc, computed from closings, are shown in the picture. where b, b and b are estimated using the least squares method and e[n] are residuals of the model. Since the t-tests on coefficients b and b are significant on the 5% level, we have evidence of dependence of rc[n] on ro[n] and rc[n-1]. The coefficients b and b are recognized as significant also by the familiar Fisher's F-ratio testing the null hypothesis H0: b=b=0 vs. the hypothesis that at least one of the equalities fails. This points to dependence of c[n] on o[n], c[n-1], o[n-1] and c[n-2], because all these values must be known to get the necessary returns. Regression analysis utilizes several basic data visualizations. First of all, plots of the dependent variable against the explanatory ones (partial plots). E.g. 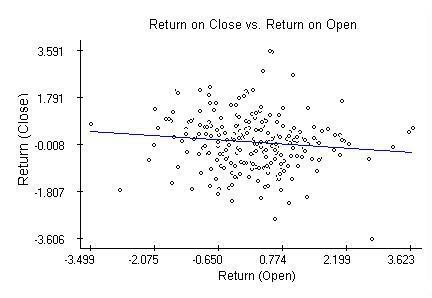 plot of the return on closing values against the returns on opening indicates a possible negative correlation emphasized by the regression line estimated by the least-squares method. Regression analysis assumes the residuals of the model are independent,identically distributed Normal random variables. These assumptions areverified by plotting the residuals against the lag, against the predictions and calculations the autocorrelation and quantile plots. The plots are provided next and overall they support the assumptions except one. 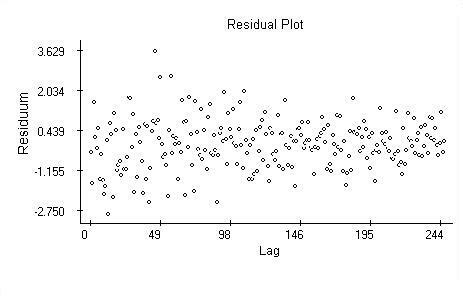 The plain residual plot indicates the variability of the returns may be changing (decreasing) over time. As the Dow-Jones average values peak, the daily returns decline. 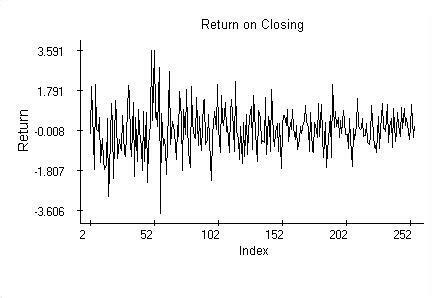 Time-dependent variability of market data is commonly recognized and must be handled using special classes of models. 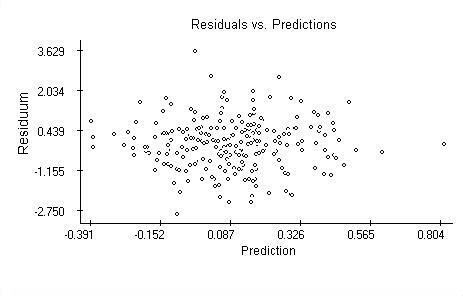 The residuals plotted against the predicted values are randomly scattered. 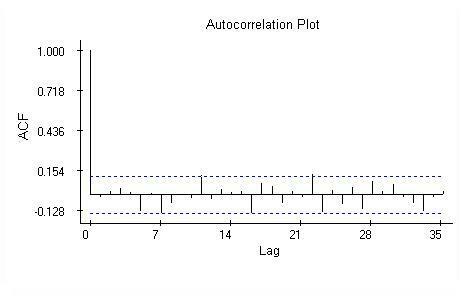 The autocorrelations appear not significant. 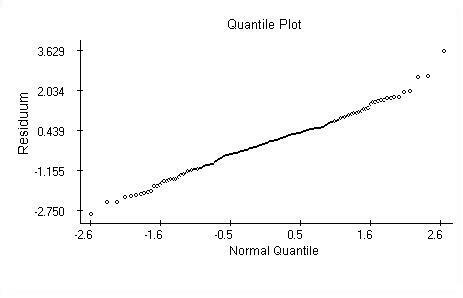 The quantile plot supports the Normal distribution hypothesis. The Kolmogorov-Smirnov test of normality also does not reject the null hypothesis. To assure that the significance of the regression coefficients is not caused by some exceptional values, seven closing values (3% from the sample total) with highest Cook's distance have been dropped and the tests were re-evaluated. As to significance, the results have not changed. Though the model looks healthy up to the unsteady variance problem, for periods of data longer than one year the changing variance depreciates the fit up to a stage when the model is of no use. For the goal of this brief study the result is satisfactory. The data used in the example are available from the Yahoo finance web site. Linear regression, t-test, F-test, Cook's distance, Normal distribution, quantile plot, time series, residuals, modeling, prediction.